We stayed in an amazing resort style complex called Canaves Oia Sunday Suites. This place was beautiful! It’s small and intimate so you get to know everyone that works there. The rooms are beautiful, super clean and they have an amazing restaurant. 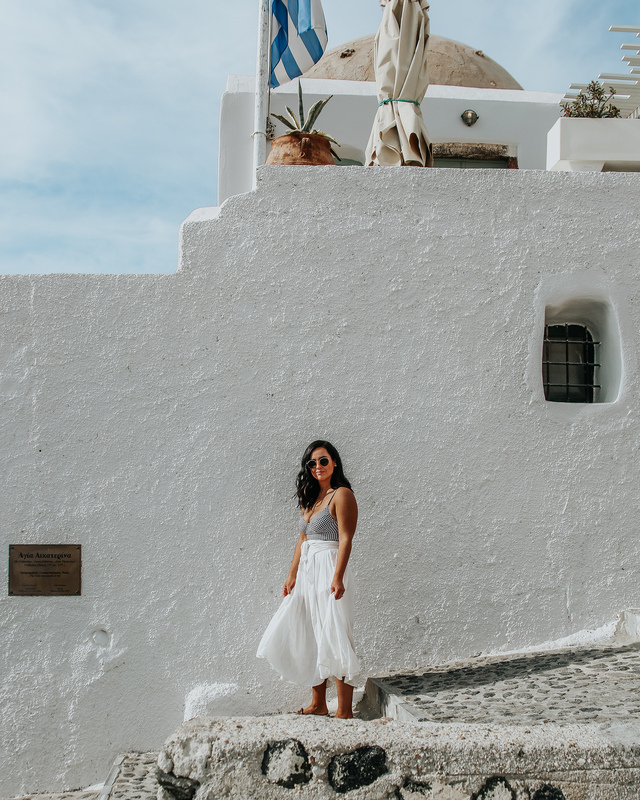 One thing we quickly learned about Oia, Santorini is that it is very hot and humid during the day. You can really only walk around for an hour or two before you are tired and sweating. If we wouldn’t have had a pool, I honestly don’t know what we would have done for 5 days! 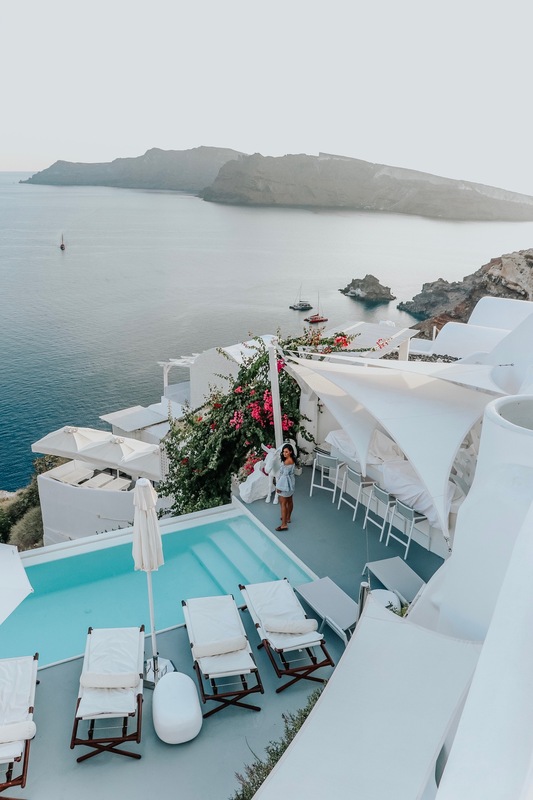 My #1 tip for those of you who are planning a trip to Oia, Santorini is to choose a place to stay with a pool. You can wake up and have breakfast, grab a coffee, walk around and then chill by the pool during the hottest part of the day. Then towards the evening, shower and get dressed for dinner and to watch the sunset. 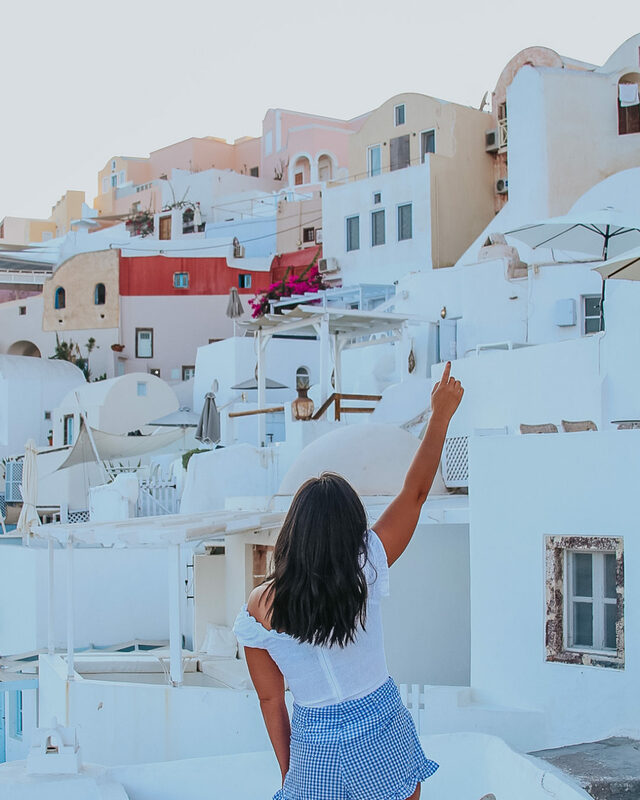 Paying extra for a place with a pool will really make your stay in Oia more pleasant. To be completely honest, we were not very impressed with the food in Oia, Santorini. It was very overpriced and we didn’t find many authentic Greek style restaurants. Most resorts and hotels include breakfast and this would be my second biggest tip: stay at a place that includes breakfast. Their breakfasts are gourmet and include everything from a variety of egg dishes to crepes, pastries and beyond. 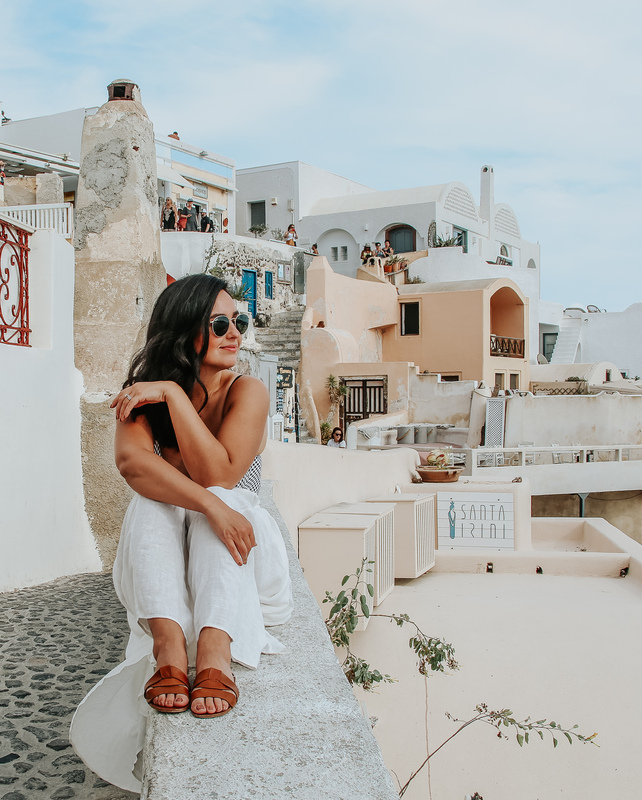 We would eat a really good breakfast at the hotel each morning and it was convenient because there really aren’t many breakfast places in the little town or Oia. 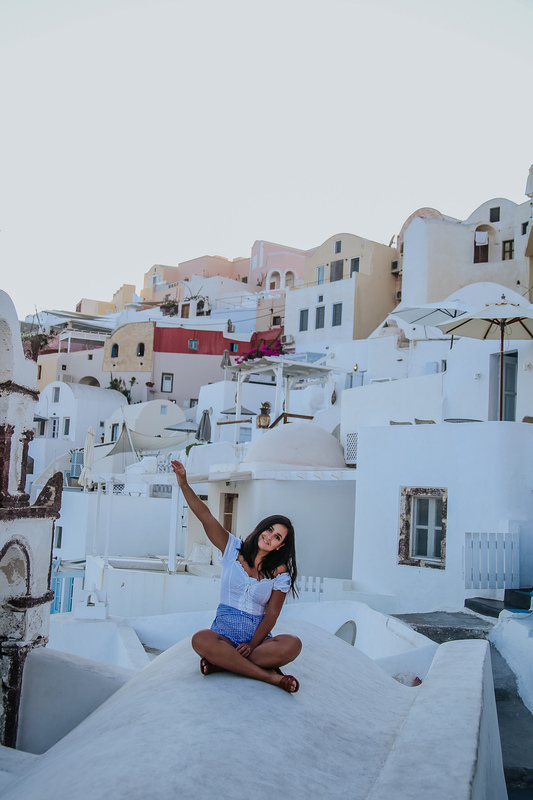 The last thing you want to do is roam around Oia looking for a place to eat in the morning, the options are limited. For dinner, I would highly recommend Ammoudi Fish Tavern. It is authentic and delicious and you are literally seated right on the water. 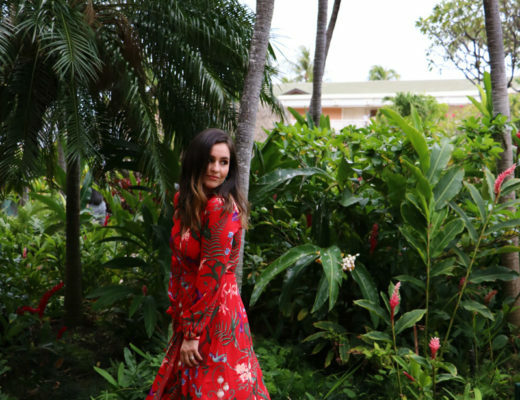 It’s the perfect setting for a sunset dinner and it’s located where Sisterhood of Traveling Pants was filmed! For really good coffee and pastries, visit Meteor Cafe (they don’t have a website). Not only is their coffee amazing, but this is the cutest little cafe I have ever been to with an amazing view! 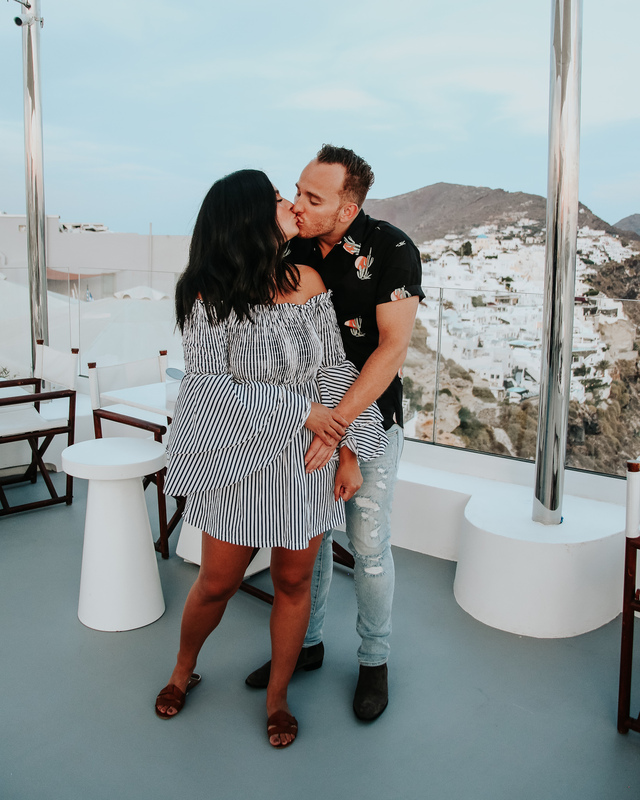 If you are looking for a few other options of where to eat, this is a pretty good list and they all have amazing views. We flew from Portland to NYC to Athens. 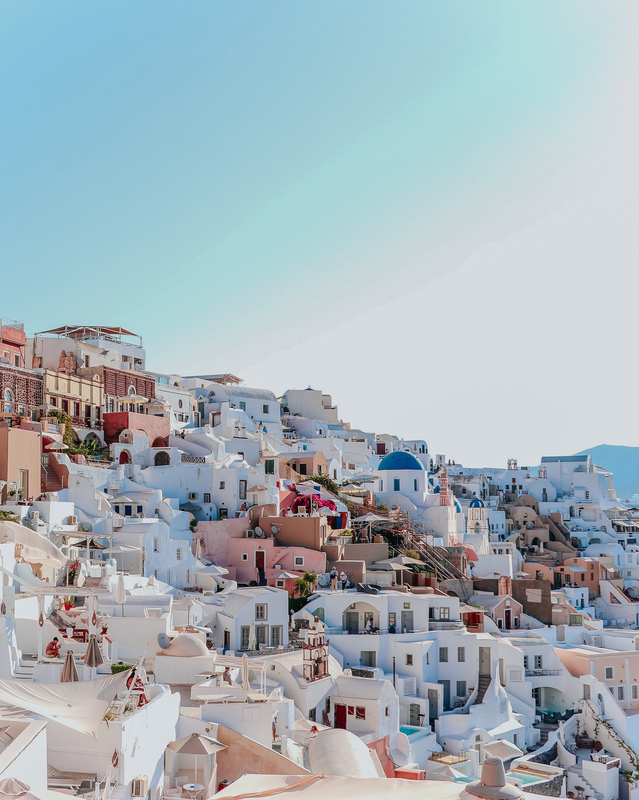 From Athens you can either take a speed ferry or a plane ride to Santorini. The ferry is about 4-6 hours because they make a lot of stops and a plane ride is 45 min. The ferry costs about $86 while a plane ticket cost us $180 euro. I don’t think one way is better than the other, it’s all a matter of budget and time. For us, we didn’t want to waste time on the ferry so we took a quick plane ride to the island. We did take a speed ferry from Santorini to Mykonos and that was not bad at all. The boats are really big so you don’t get too much motion sickness. 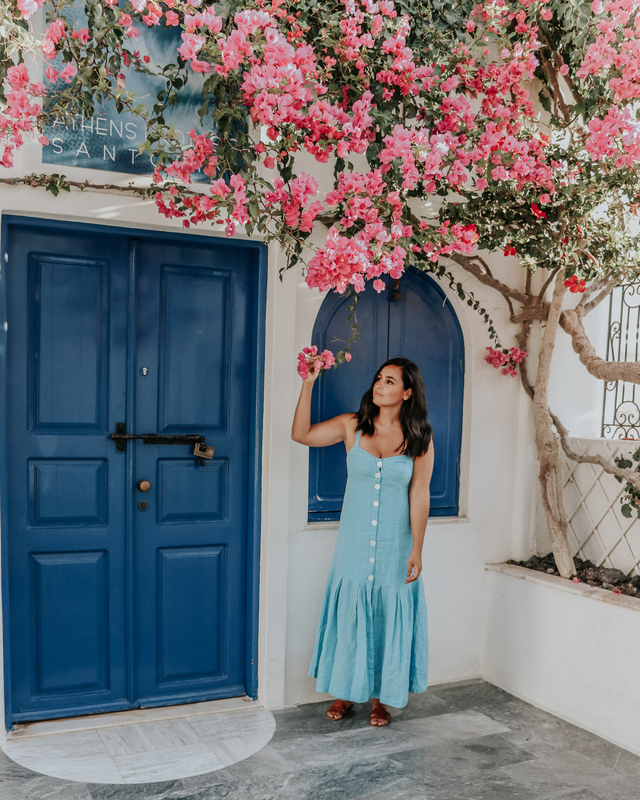 I will do a Mykonos travel guide too, stay tuned for that if you are going to be visiting multiple islands. But like I said, either option works and will get you where you want to be! 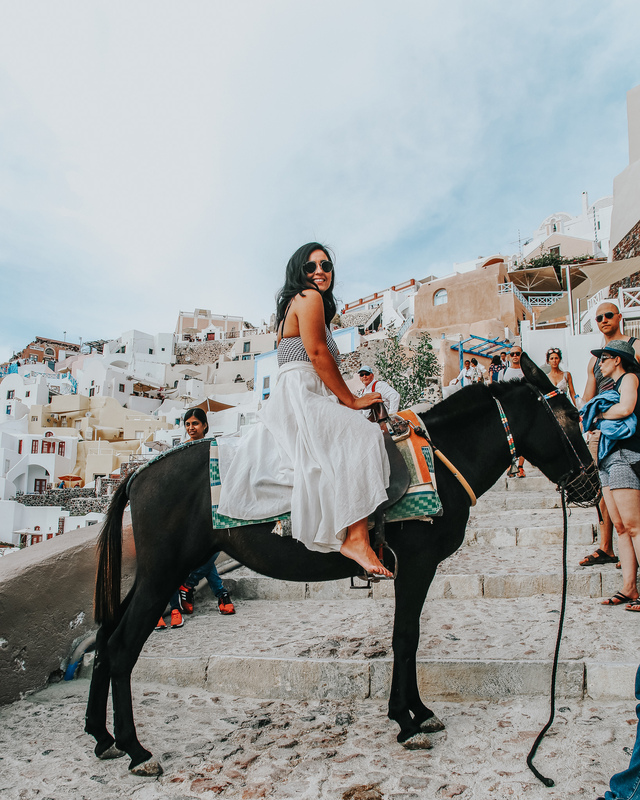 Just be aware, if you take a plane from Athens to Santorini or any island and you have bags to check, the fees are ridiculous! I will talk more about how to pack only a carry on for a long overseas trip to help you save time and money with your luggage! 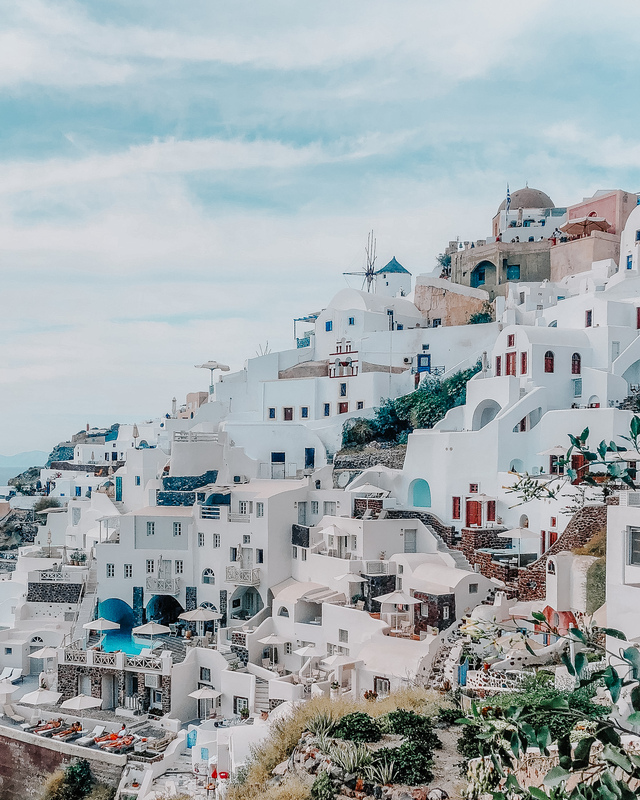 If you choose to fly from Athens to Santorini, the Santorini airport to Oia is about a 20 minute drive. Most lodging accomodations will offer a pickup but you can also take a taxi. You can find them when you arrive at the airport. A taxi ride from the airport to Oia is about $40 euro. 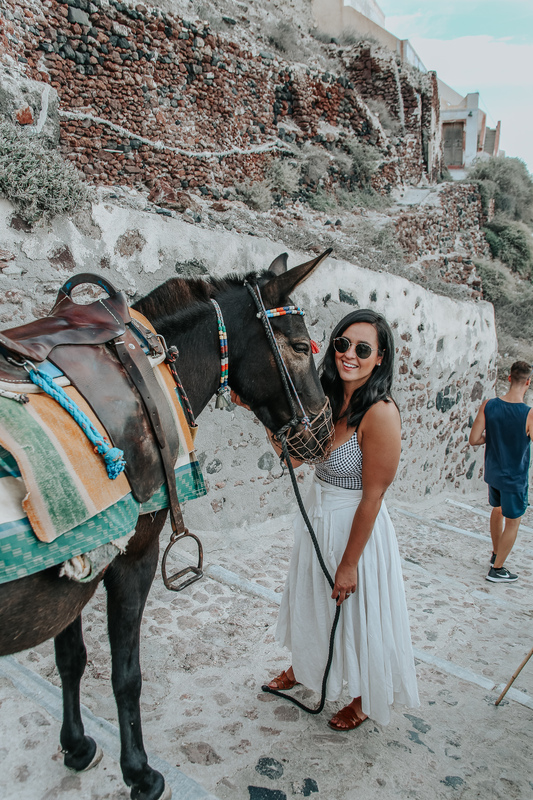 In Oia you can either take a donkey (just kidding no one really does this anymore, they are just there for the tourists), or you can just walk! The town is so small that you can get from one end to the other in less than 30 minutes on foot! Not only that, but cars don’t actually drive in Oia. They park right outside and then you have to walk through the town on what they call the Caldera. It’s the paths in between all of the beautiful buildings. Atlantic Books – one of the oldest books stores in Greece and literally like something out of a movie! The bookstore is in a cave house and has a great selection of hard to find books. A must see! 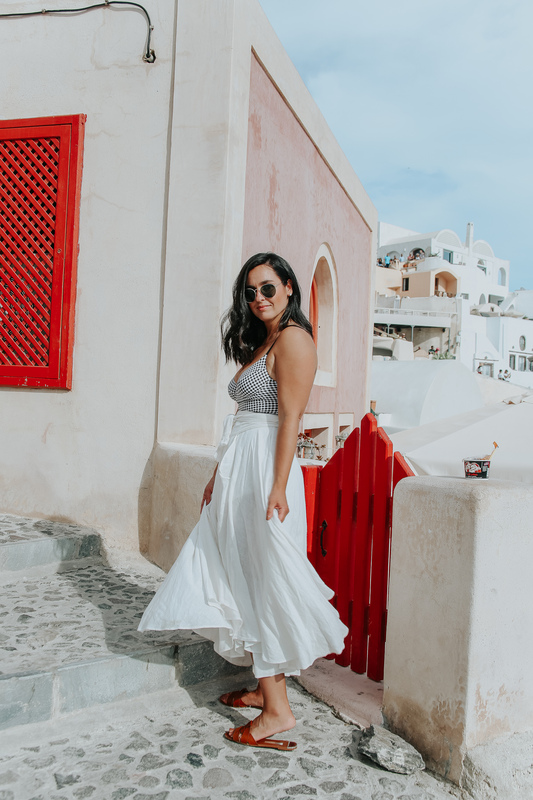 Ammoudi Bay – this was one of my favorite parts of Oia. 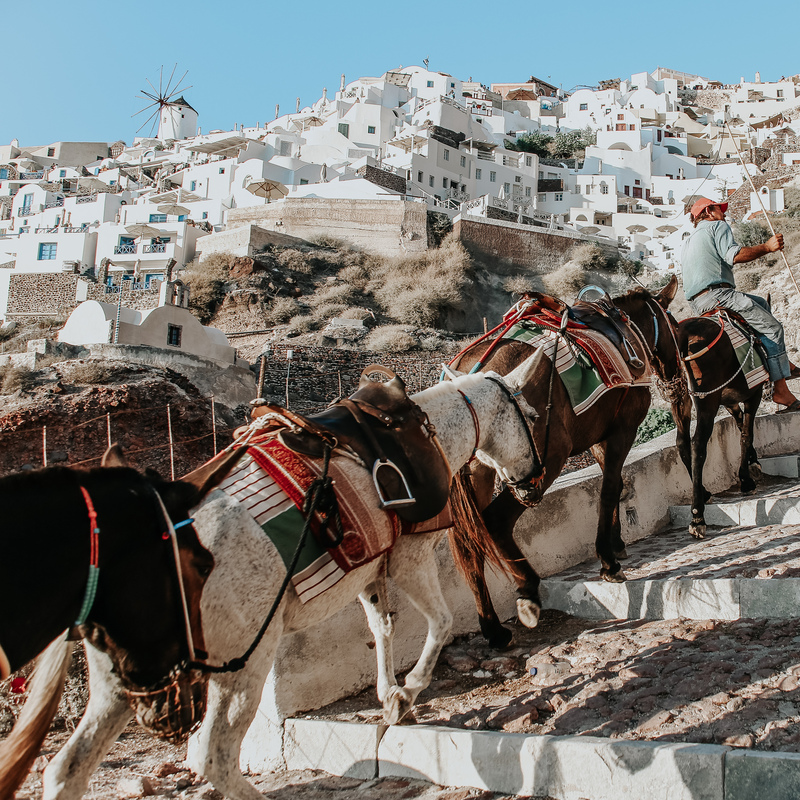 You have to hike down the long set of stairs to get there (or take a donkey if you are brave or a taxi) but it is so worth it. Ammoudi Bay is where Sisterhood of Traveling Pants was filmed, in particular the scene where she meets Kostas on the dock. There is dock area where you can jump in and swim. You can walk around the little town and eat at the different places down there. I highly recommend you visit this! 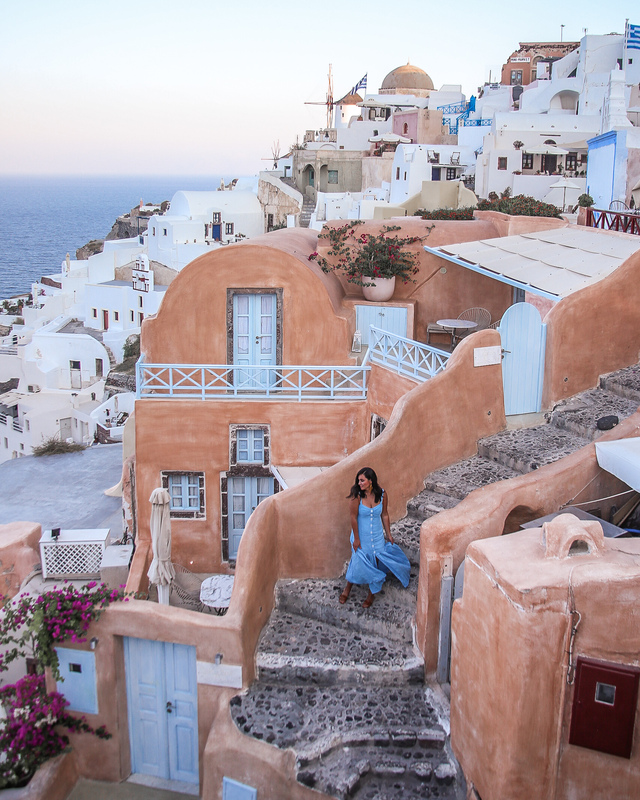 Roam the streets and markets – basically just spend your time walking the streets of Oia. Every single corner is beautiful and picturesque. Pool time – like I mentioned before. Oia is a small little town and it gets really hot during the day. Spending time at a pool is the way to go. 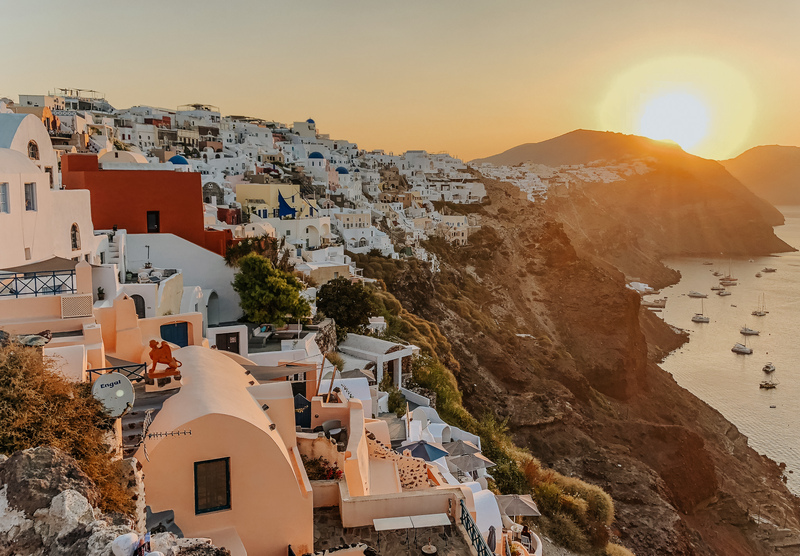 Sunset views – We watched the sunset every single night and you can really see it from anywhere in Oia, just follow the crowd! I hope this travel guide was helpful! I tried to keep it simple and to the point! If you have any questions, feel free to ask in the comments below! 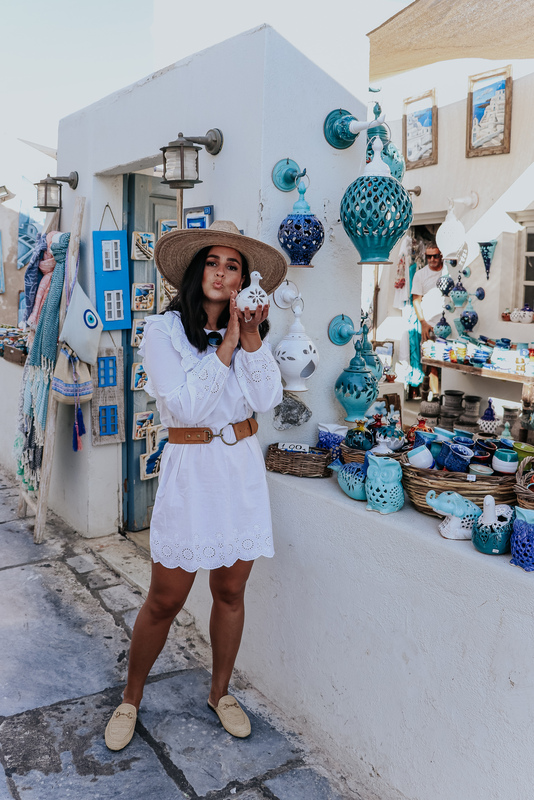 I am working on a post to share all of my swimsuits, Greece outfit details, a Mykonos travel guide, and how to pack for a long trip overseas! Stay tuned for lots more vacation content. PS: thanks for reading and following along!